My Sugar Series (December 2008) is made up of desserts that I’ve enjoyed recently. Because the holidays spell sweet excess, impress the people you love with any of the following desserts. They’re guaranteed to make an impression on them as they did on me. NOTE: This series ends on Friday, Dec. 19, 2008. There are bakers that I like and then there are my favorite bakers. I briefly mentioned Kitchen’s Best (KB) in my 10 Best Desserts 2005 post (sigh, the early days of this website!) Back then, it was Kitchen’s Best by Roselyn (Tiangco), who turned her high school baking hobby into a full-fledged business. Before I started Dessert Comes First, KB was my go-to bakery when I needed a dessert pronto or I couldn’t be bothered to make my own. 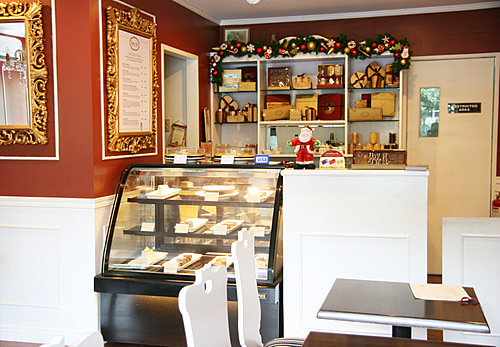 I simply adored (still do) their rocky road brownies and the banana toffee pie. Over the years, I eventually got to meet Roselyn herself and we even wound up sitting beside each other at a baking seminar last May. That was a thrill. This year, I’ve become aware of Roselyn’s Sucre et Sel (Sugar and Salt), her French-inspired line of sablés (sandy-textured biscuits in butter or Parmesan), sablé florentines (shortbread topped with a honey-candy topping and sliced almonds), lace crisps (absolutely addictive disk-shaped cookies that are sticky-chewy), and much more. 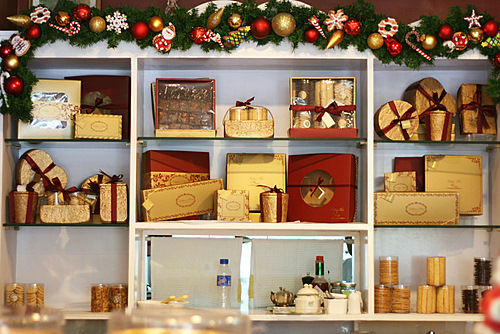 But it’s Roselyn’s love for French pastry that sparked what she calls her Luxurious French Collection. Inspired by her 11-month baking course in Paris, she churns out tartes and gateaus, sweets for the serious and more discerning among the sweet toothed. These creations are for those who yearn for desserts with more depth, more contrast in textures, and of course, undeniable pleasure. Desserts such as the now well-known Concorde, Tarte Au Citron (Lemon Citron Tart), and Opera all have their origins in French culinary history. My favorite is the Plaisir Sucré (sweet pleasure), an invention of master French baker Pierre Herme. The plaisir is a multi-layered melange of hazelnut dacquoise (nutty meringue layers), chocolate ganache, chocolate creme chantilly (sweetened whipped cream), and praline all magnificently bound together with chocolate sheets. A masterpiece. Such a sophisticated transformation necessitated a name change. Kitchen’s Best by Roselyn has become Kitchen’ Best Patisserie, and what better way to celebrate than by opening one’s own bakery? Ably joined by her sisters Martina and Bern, Roselyn has finally found a permanent showcase for her chefs-d’oeuvre. 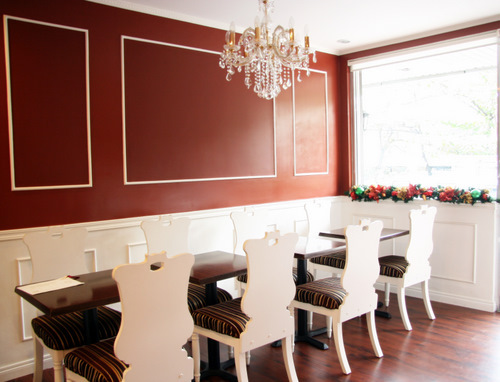 Swathed in reds and golds, the place is Victorian-meets-contemporary. 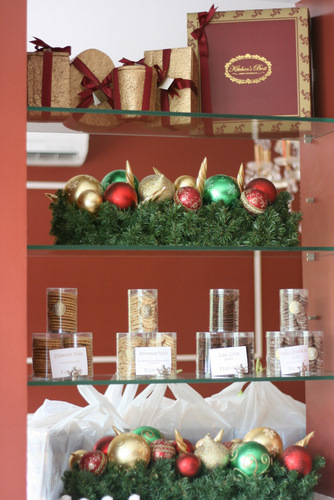 Large gold-gilded picture frames encapsulate the store’s Cake Hall of Fame as well as photos of their bestsellers. Medium chandeliers glint from above and at the back, there’s a cozy sofa complete with up-to-date magazines. “Install wifi and I’ll never leave here,” I joke to Martina. Kitchen’s Best also serves excellent food that one can tuck into before splurging on the sweets. The Mediterranean Beef (P245) comes with a rice pilaf of sorts, and their Chicken with 40 Cloves of Garlic is tantalizingly soft and flavorful, its side of baby potatoes gleaming in the buttery sauce. Boo also likes the Wild Mushroom pasta with white sauce (P280), good for kids who are familiar with carbonara. For dessert, stray from the commonplace and expand your culinary horizon. Try the French desserts mentioned above. Oh, and did I mention that Kitchen’s Best makes an astounding blow-your-doors-off-good White Chocolate Macadamia Brittle Cheesecake? It may very well be the best cheesecake in Manila. Sundays: Reserved for special functions. Their concorde is something I would never forget. It was soooo good. However, I did get to try the White Choc. 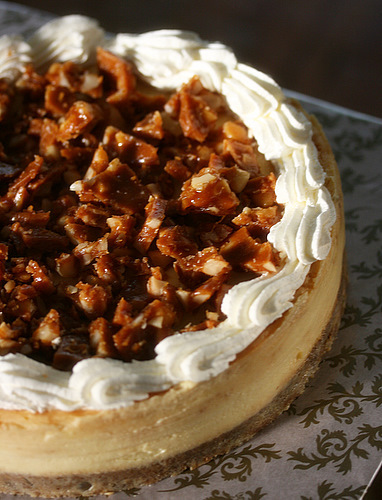 Macadamia Cheesecake, and it truly is astounding! I’m still trying to decide if it’s THE BEST cheesecake in Manila, but I’m already sure it’s up there near the top. The Chicken Melt (like little chicken pies in cup form), at P35, was pretty good, too. The filling could be tastier, but the crust was soft and buttery. Had a really bad experience there. Went there to buy a cake, (me and my best friend love it there, we buy cakes to give them away as gifts around 3 times a month) before buying a cake, went to the little girl’s room. On my way out, I was rudely confronted by one of the waitresses. She rudely told me in Filipino that the comfort room was only for customers… She didnt even wait to see if I was buying anything. And I was going to buy a cake, like I always do! I would have let this all go if she apologized, however, she just turned back as if nothing happened. And guess what, one of the owners was there to witness the whole thing. I used to promote their cakes but treating a paying returning customer like that? Im never going back. > Jul 14, 2009 How Many Bars Of Butter In These Butter Bars?